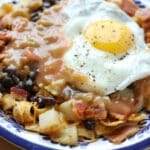 Frito Pie Huevos Rancheros is what happens when a craving for Huevos Rancheros meets a need for Fritos. 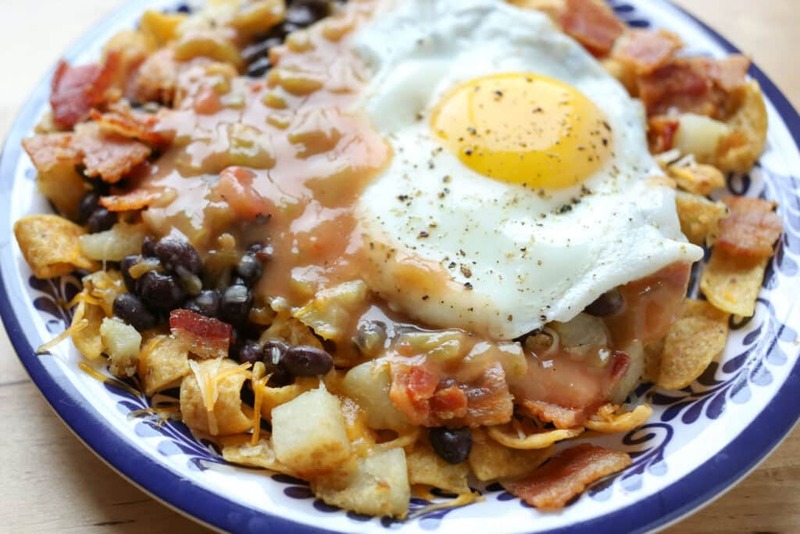 This breakfast begins with a layer of chips, then you add black beans, chile sauce, roasted potatoes, melting cheese, bacon, and top the whole pile with an egg and more chile sauce. From the first crunchy, spicy, gooey, egg soaked bite, we loved this meal. I suspect I’ll be making this again very soon. 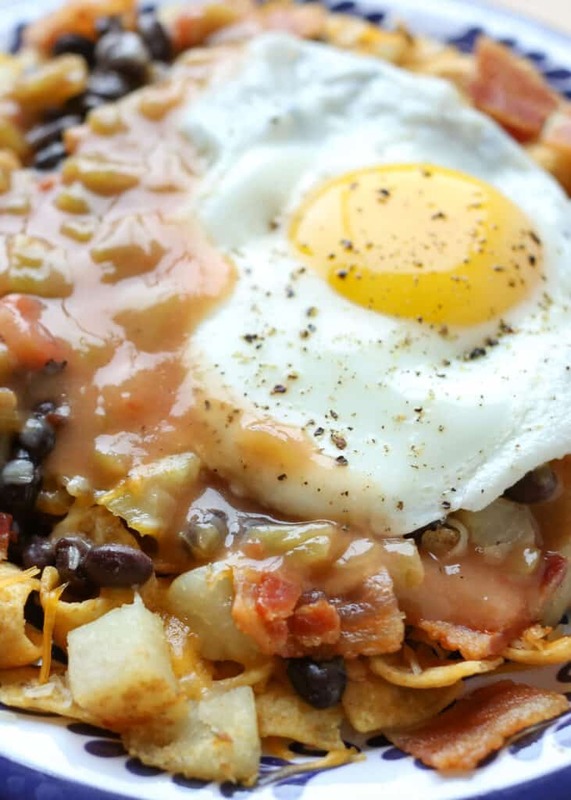 Frito Pie Huevos Rancheros is a delicious brunch option for any occasion. Want a few more breakfast ideas for a fun weekend meal? How about Blueberry Lemon Baked French Toast? or German Apple Pancakes? These Smoked Salmon Scrambled Eggs are a fancy twist on a simple breakfast for any occasion. What is YOUR food weakness? I’ve never been able to walk by a bag of Fritos without eating a handful! For more unforgettable breakfasts, try these Chocolate Cherry Pancakes. They are a treat that you won’t soon forget. This Copycat Snooze Spuds Deluxe is a plate full of deliciousness that is sure to put a grin on your face. Start the potatoes in the oven, then cook the bacon. 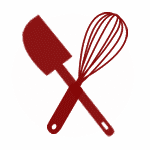 (Use the directions linked in the recipe ingredients to cook each of the ingredients.) Stir together the beans with 1 cup of chile sauce and heat in a small saucepan or a glass bowl in the microwave. When the bacon is finished cooking, drain it on a paper towel lined plate and then cut it into bite size pieces. Cook the eggs to the level of doneness that you prefer, season with salt and pepper. Place a handful of chips on a plate, top with black beans, potatoes, cheese. Warm in the microwave for about 30 seconds, just until the cheese has melted. (You can also melt the cheese in the oven, if your plates are oven-safe.) Top with an egg and as much more chile sauce as you like. Enjoy! I really like the 505 chile sauces when I don't have time to make a homemade chile sauce. Choose your favorite cheeses for this dish. We usually have a pre-shredded Mexican cheese blend and it works great. Cook the eggs until they are as soft or firm as you like. We like our eggs nice and runny for this dish; the egg yolks mix with the chile sauce and the combination is perfect. Looks delicious and definitely my kind of meal - I might have needed two eggs though. Such a fun idea, my boys would go crazy for this on a weekend morning! One of my local weaknesses is a place called Petros that services their specialty chili and chips combination from the World's Fair in Knoxville. I LOVE those fritos, chili, beans, cheese, tomatoes, black olives and sour cream. So you can imagine how great I think this breakfast idea is! Great one, Mary. Hi! Just wondering which sauce you used for this?? I clicked on the links leading to the green, red, and salsa sauces, but they don't look like the one pictured. I typically use 505 green or red chile sauces when I don't have homemade sauces on hand. I linked to them in the notes, so that you can see the packaging. I hope that helps! I made these after poking around your blog one day. So good!